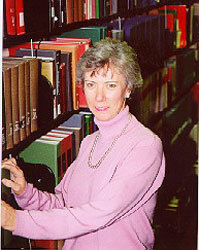 Kathleen E. O’Connor is celebrating her 35th year at Falvey Memorial Library. She began working full-time as a database manager in August 1977 after receiving her master’s degree in library science from Villanova University in May of that year. Before completing her graduate degree, O’Connor had worked as a student aid in Falvey from 1976-1977. In 1979 she was appointed head of the Circulation Department. She was promoted to Systems Librarian in January 1987 and served in that capacity until 2006 when she was appointed Senior Librarian for Systems Planning and Support as well as co-leader of the Technology team. She is also a member of the Assessment team. In 1999 O’Connor participated in the Electronic Reserve Task Force that received a Distinguished Service Award from the University Staff Council. Congrats, Kathy! It’s been great working with you over the years! Wow!!! Way to go!! Congratulations! !